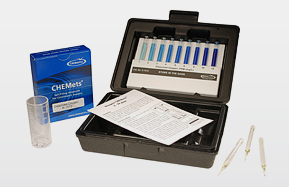 Chemetrics K-7512 CHEMets dissolved oxygen kit. The range is 1 - 12 ppm using the Indigo Carmine method. This kit is ideal for field applications as there is no preparation. Snap one of the CHEMets pre prepared vacuum tubes in a vial of sample water. The resulting blue colour change is then compared to the colour comparator that is included in each kit. 30 tests included in the initial kit. Additional reagent sets can be purchased separately. 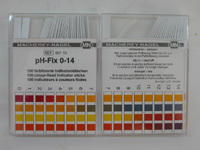 For detailed information on Chemetrics dissolved oxygen kits please follow this product link to the Chemetrics website. For detailed information on Chemetrics technologies please see Technologies on the Chemetrics website.